You know how when you're watching a movie and it might seem a little silly and lightweight but basically everything's amusing and enjoyable and good...and then it does something so terrible that your brain falls out? 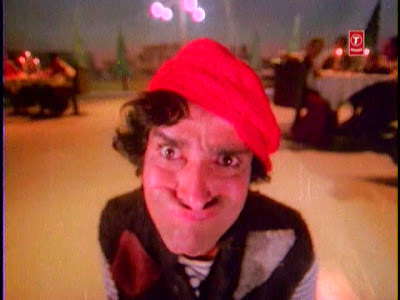 No, Shashi looking like a children's tv show mime-tramp was not the brain-felling thing in question. and her reaction is dopey-faced goo-goo eyes. I couldn't believe it. WHO MADE MY BELOVED NEETU DO THIS? WHY? Writers Mohan Kaul and Surhid Kar answer the age-old question "How will I know if he really loves me?" [Haha! Now it's stuck in your head! - ed.] with a resounding tight slap! 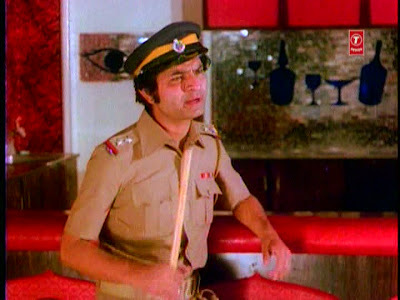 Up to this point, her character was wonderful: friendly, open, lively, sensible, and drama-free (she seems not to have any parents, but neither she nor her brother [Asrani as a police officer] have any related issues). I guess these writers were single-minded and uncreative enough to decide that a shock to her carefree lifestyle was the only way to reconcile her with the available love interest, a prayer-spouting man-child. It's such a disappointing exchange. 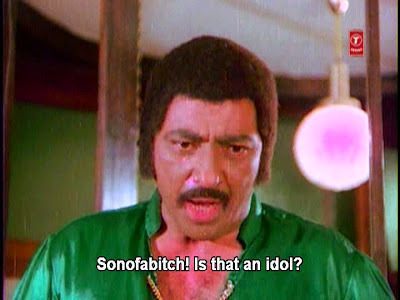 Soon after, Pannalaal even goes to Neelam to apologize and she wheels off and smacks him when he asks for forgiveness...and then we realize that was just in his imagination. Sigh. The disappointment continues. His actual apology - which I do think is heartfelt, at least - is met with breathy come-ons and an attempt to kiss him, then a quick-change into the more conservative outfit he has brought her. 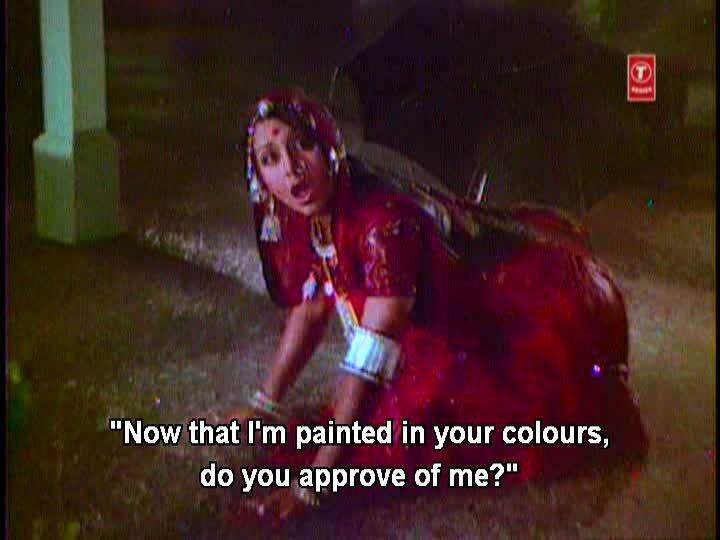 A costume quick-change, of course, signals a song ("Dhal Gayi Tere Rang Mein"), in which she is eventually drenched in the rain and crawling on all fours as she sings "now that I'm painted in your colors, do you love me?" VOMIT. Neither of the romances in this film is convincing. 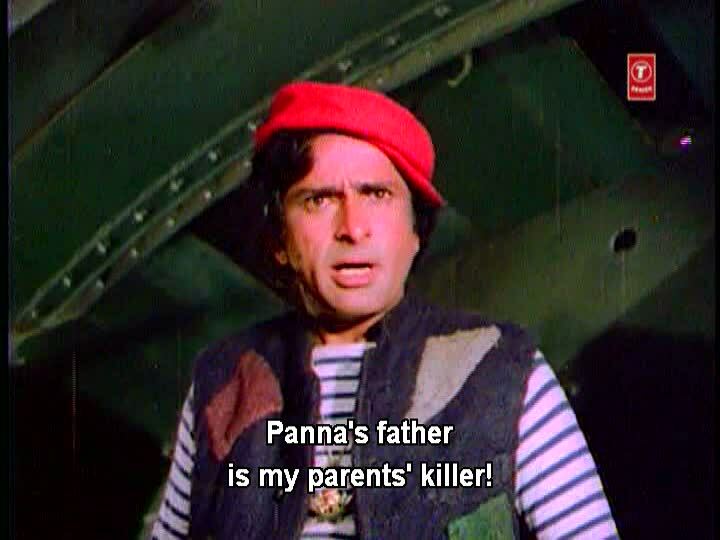 In addition to the Neelam-Pannalaal lifestyle mismatch, or "lobotomy" if I am all worked up about it, which I am, Heeralaal (Shashi Kapoor) falls for the fussy and indignant Ruby (Zeenat Aman). 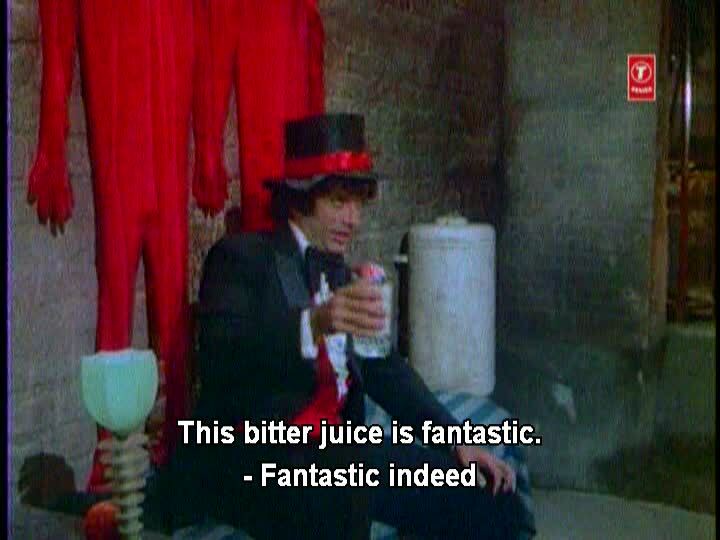 Zeenat as the straight man gives Shashi the opportunity to clown around, and it's charming enough but failed to really move me. These characters love each other because they are there and perhaps because the women are so pretty, not because affection or compatibility are demonstrated. I did like their love song, though, with great reverberating brass. 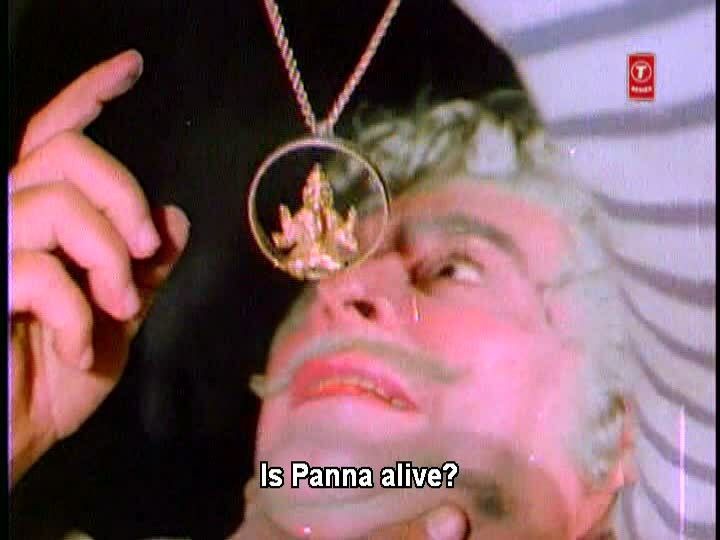 vaguely looking for Pannalaal's father and the man who killed Heeralaal's parents, which we see in the excellent introductory flashback (Ajit as smuggler Kalicharan fits both of these descriptions, and as Memsaab points out becomes the only villain I've seen to accidentally kill his own child). "Hindi Movie Irony Bell goes CLANG!" 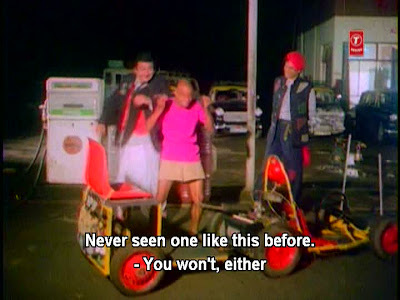 They really are on the spectrum towards Manic Pixie Dream Girls, which is hard to buy when Shashi is 40 and Randhir looks even older, and I don't think "whimsical vagabond" is either of their strong suits. H&P are more a point of focus or relevance for whatever the filmmakers wanted to toss in here than they are proper protagonists who take action. The writers should have given them lighter- and softer-hearted partners (since changing the heroes is probably out of the question) and some more development from tumbleweed moppets to avenging pugilists. And you get to see Randhir's tighty-non-whities! are duplicates of themselves. As one does. And what follows is about 40 seconds of pure silliness set to a jazzy walking bass as H&P dance with their scuba-suit selves in moves almost like a West Side Story rumble. 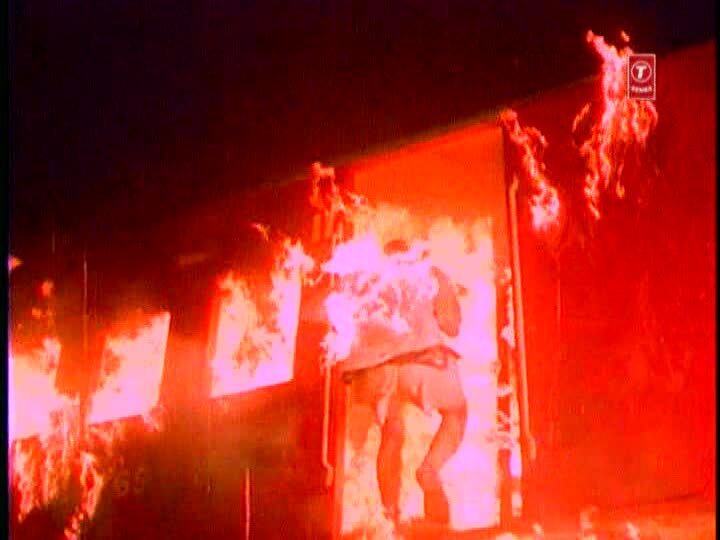 The beginning bit, when the suits leap off the wall and strut-dance at H&P (below), is probably my favorite. I love it when Kapoor men have to act drunk. 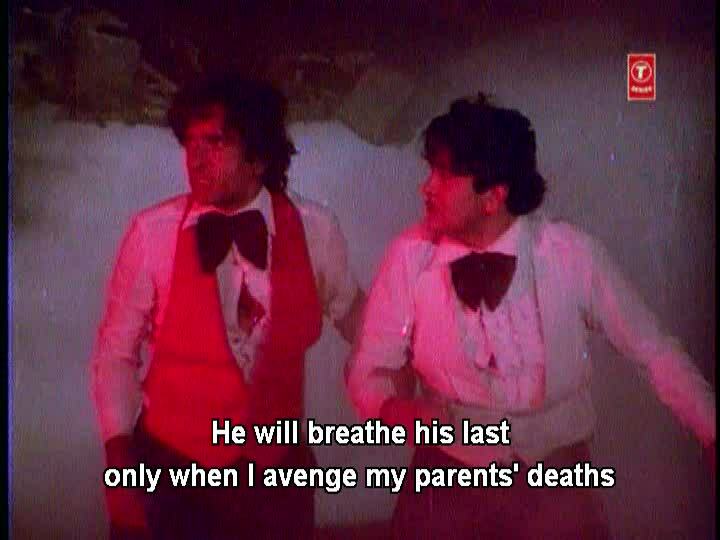 Maybe this is what it's like chez Kapoor all the time! So there, within about 15 minutes, are reasons to hate and leave and love and cherish Heeralaal Pannalaal. Such is the magic of the masala mix, I guess. For me it's like Aa Gale Lag Jaa: if you can overlook or move past the GIANT GLARING WTF, or just pretend it didn't happen, there is much to enjoy. With that approach in mind, let's float along with the boys in the wave of fun and silly, a method conveniently parallel to that of the basic structure of this film. For example, they are literally dropped into the heroines' lives from the ceiling of the stage where the ladies are about to perform in a dance competition. I was sad to see this arrangement of the actors - I knew it meant Neetu would have to be with Randhir instead of Shashi. A note on the dance competition: it's actually very handy for Neelam and Ruby that H&P dropped in because the scheduled performers hadn't shown up. Scheduled performers named Helen (heehee!) and Papsy. Papsy. My sisters, is this not one of the more unfortuante nicknames (or, worse, actual names) you can imagine having? Let's see...what else.... How about some excellent subtitles? If the following is an actual phrase, then les Anglais have some serious PR work to do. This next one is delightful not just for evocative power but orthography as well. 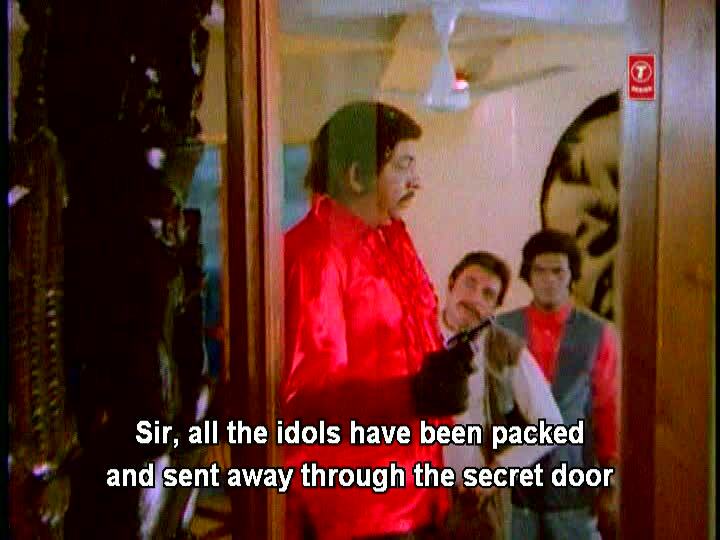 All this talk about idols reminds me that I have not told you that most of the important smuggling in this film is done through idols. Heeralaal's father was an idol artist, and evil Kalicharan used to hide his beads diamonds in his work. I love this picture. In just one frame it tells you at least 20% of what you need to know about this film. Panther (Amjad Khan) likes a plain-spoken henchman - no need for euphemisms or codes just in case the police are listening or there's a traitor in your midst. Just another day at the lair - they might as well be talking about widgets and FedEx. Don't know about you, but head-to-toe embroidery, pom-pom cuffs, and a giant feather headdress is how I disguise myself as Chinese. Do you hear the finger quotes on that last word? There is so much truly excellent villain interior design in this film, sometimes accompanied by "These Boots Are Made for Walkin'"-style background music! Torture areas! 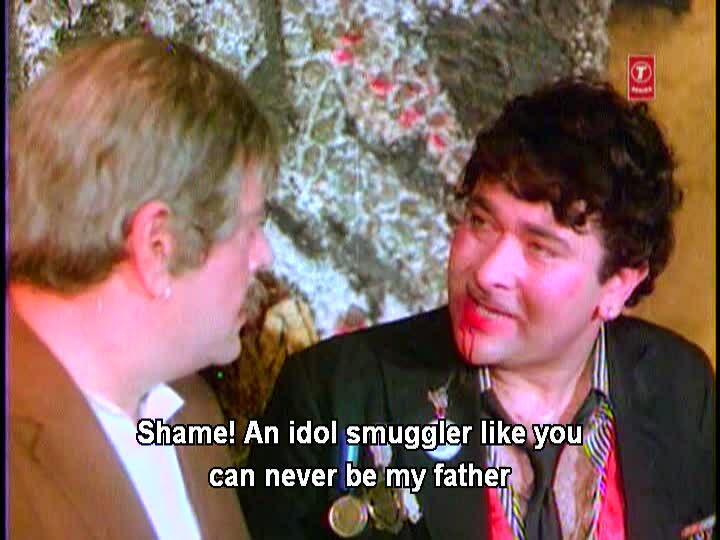 Now that you have seen Amjad Khan in a purple upholstered bed with a leopard throw and a nameless woman, is your life not complete? The lair's main entertainment stage and bar are a fizzy sherbet sundae of pinks, swoops, mirrors, and fluorescent ponies. 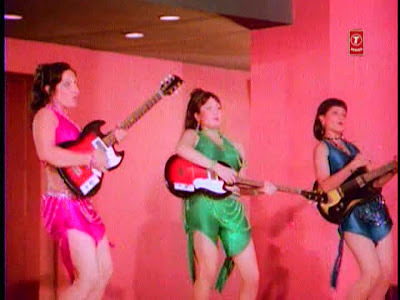 And Bolly Robert Palmer girls! 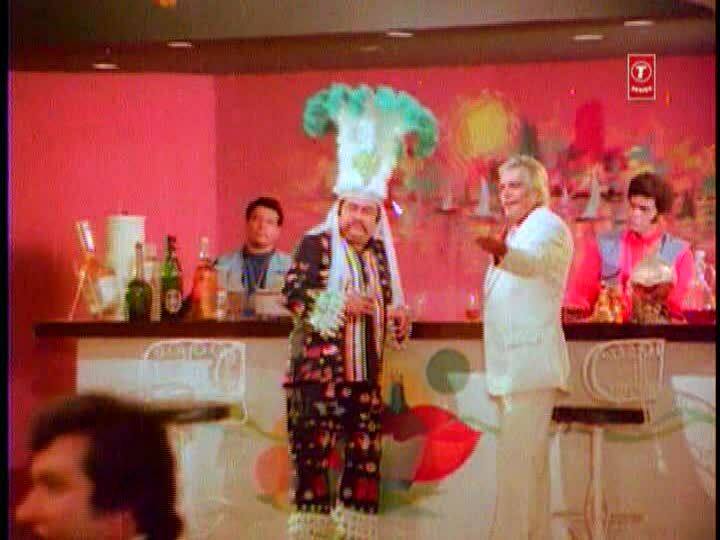 With Amjad's antics, Prem's disguise, and Zeenat's zombie dancing, it's hard to have any mental energy left to notice the classical-ish sculptural column and rainbow art behind the bar! 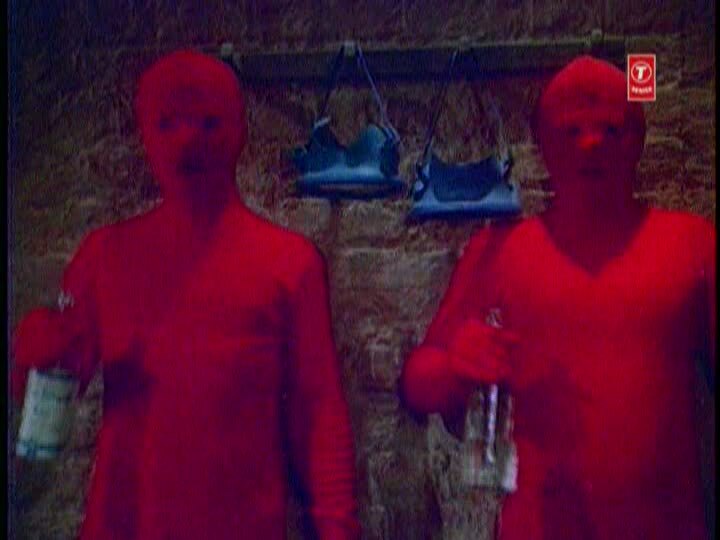 I don't know where this is supposed to be, but it's the bar I was looking for in Maha Badmaash! Ranjeet has a small role as Ruby's helpful and loving but self-proclaimed loafer of a brother. He somehow helps get her into the villain lair as a singer, and someone told me that she is supposed to be blind in that scene, which would explain why Zeenat occasionally acts like she's high. My DVD is missing any such conversation/information, so if you can remember how that plays out, let me know. There are more instances than I could count of police and villains shouting "Hello? HELLO? HELLO HELLO HELLO??? " 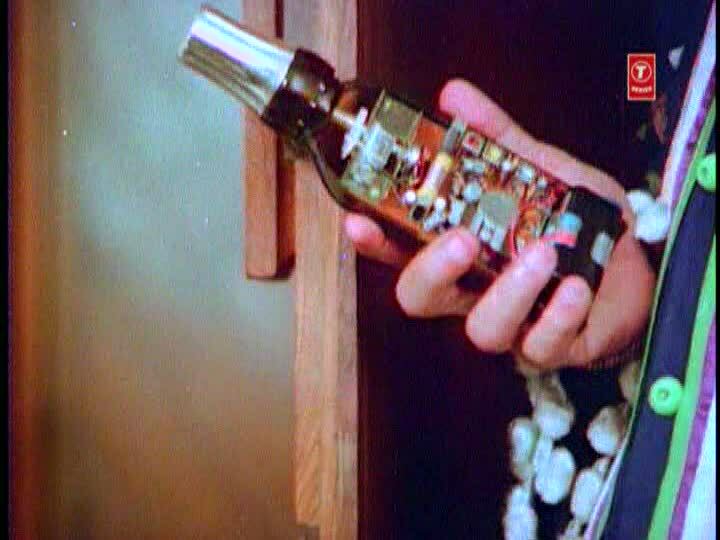 into barely-functional audio equipment, including this sure-to-be-regulation transmitter bottle. Heeralaal tries to strike a deal with god in the face of the perils in final action sequence. Wearing ashes and patches he still looks good. and wouldn't you know it, the two collide in a spectacular way. 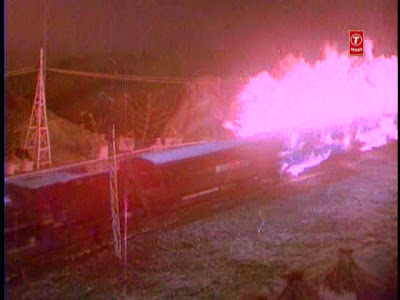 I watched this bit three times and am convinced that is a real train crashing through a real wall and temple forecourt - maybe "real if you count 'made of styrofoam,'" but still, full-sized train and full-sized architecture. It's definitely not a model in those big shots at the end. I'm impressed! 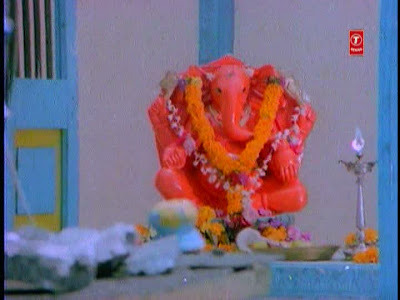 And I love that it is only Ganesha who can stop the train and end the tragedy - this idol is definitely not under the control of the villains and he is placing, not removing, a crucial obstacle. Thanks Gesine for the film! 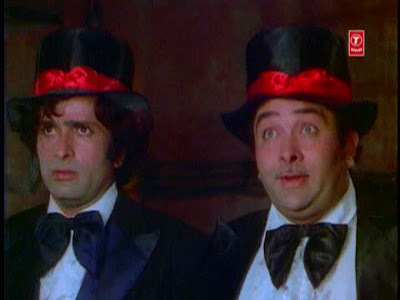 I hope my next Shashi writeup will be...whatever we watched in your flat in June! 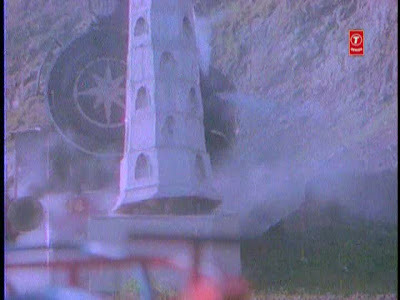 Pakhandi, was it? * Aside: in the notes I took while watching the film, I wrote "Amjad Khan is doing excellent LAIRING AND GLARING! HAHAHAHAHAH I crack me up!!!" This was an excellent collection of lairing and glaring that deinfitely cracked me up! 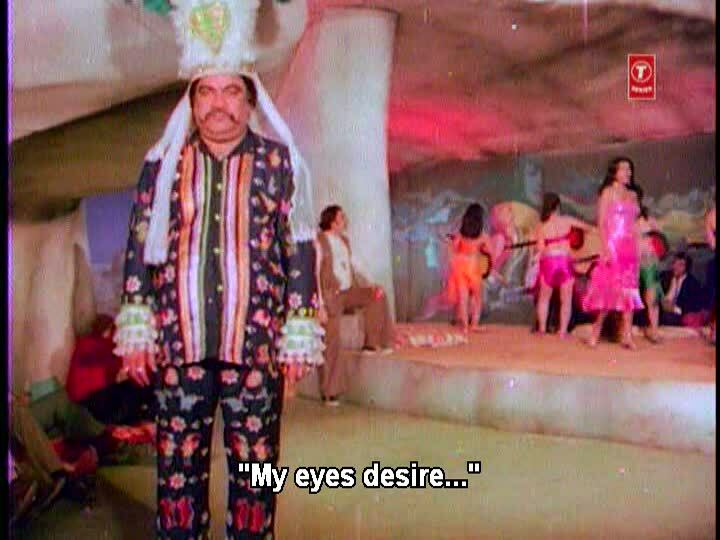 I will avoid yaar but this will make me giggle for days when I remember the feather duster headdress and the leopard print and whatnot. I will strive to forget the Slap You Into Love bits. Re: Randhir looking older, you'd think the Shash would've taken a hint from his nephew and avoided the drank but no. Holy Masala goodness! 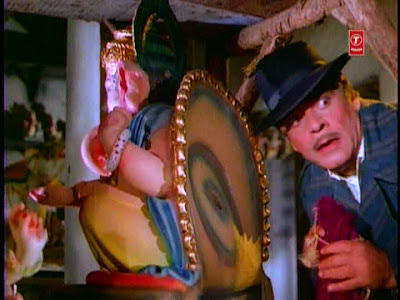 I really need to see this epic film now, if only for that batshit costume Premnath dons! I want that hat this instant! Even though I like Randhir, he looks so lethargic and a bit moti too soon, and it just strikes me as wrong that he's romancing his sister-in-law! 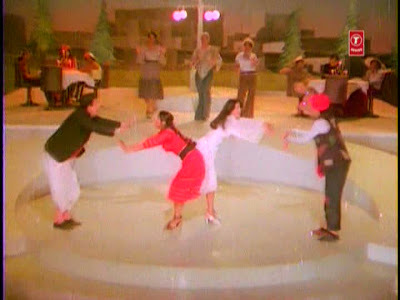 But ohh well if only for Shashi and Zeenat's crazy dancing I'll get this! Woahhh...this looks like absolute nonsense. I think i'll always stay away from this. Thanks for the warning!!! It's a total WTF of a movie. I think that I sort of accepted the Slap of Love as "surrendering to the aesthetic" and was happy to move on since it was relatively isolated and surrounded by such lunacy. 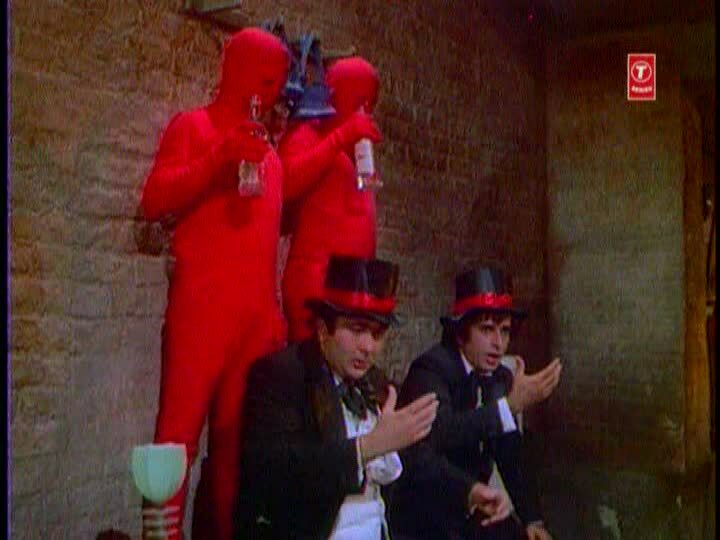 "I love it when Kapoor men have to act drunk. 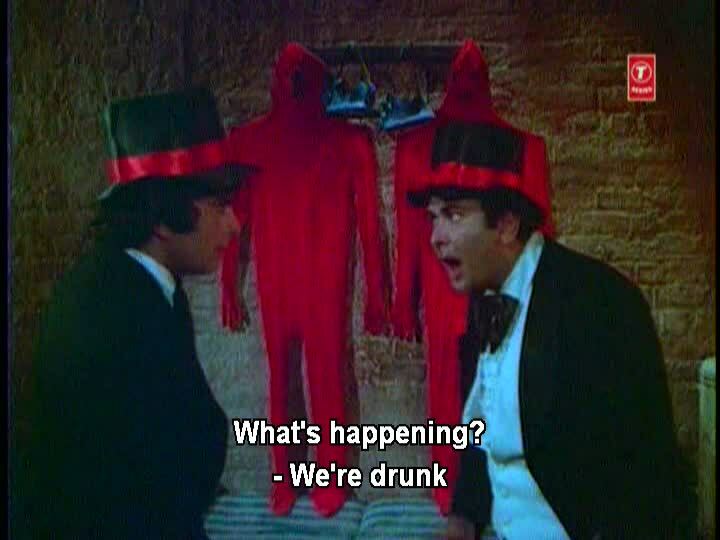 Maybe this is what it's like chez Kapoor all the time!" made my coffee come out through my nose. That blue egyptian bar is in a bunch of films. We might need to research it. Amrita - Hahaha yay! I can't really say you need to watch this for Shashi but he does his usual best and is as charming and convincing as possible given the material. Really, though, that feather duster headdress is one of the highlights. 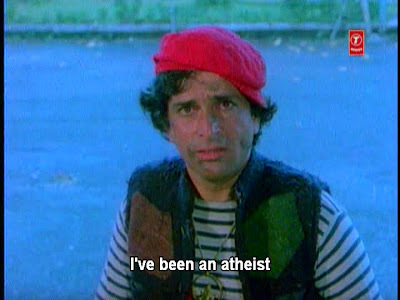 Can you recommend any standout Randhir films? I have only seen him twice but I find him hyperactive and really, really irritating. I always wonder what it's like for these Kapoor women to have to do lovey-doving with in-laws...Neetu with Shashi or Randhir, Babita with Shashi...well, at least it was Shashi some of the time? 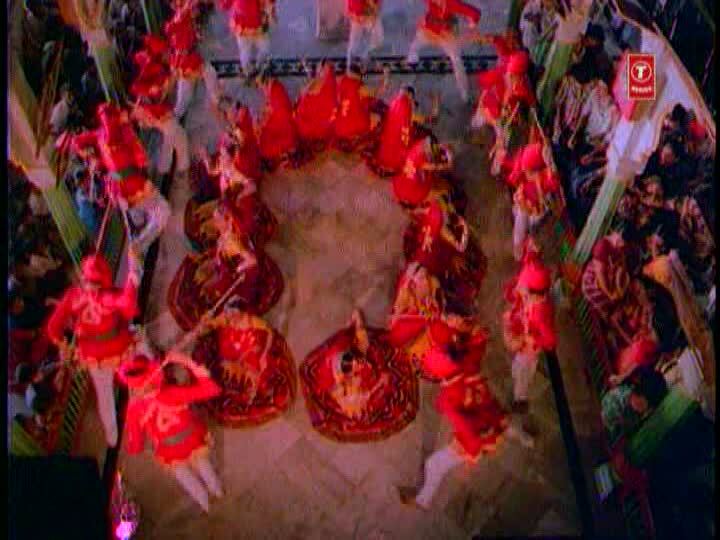 memsaab - Yes. Exactly. And I hate it when aesthetics and my own principles are in such stark conflict! What to do! I'd also recommend Jawani Diwani with him and Jaya Bachan, its a really funky film about those two falling in love in the 70's and its got a road trip which is always great in my book! 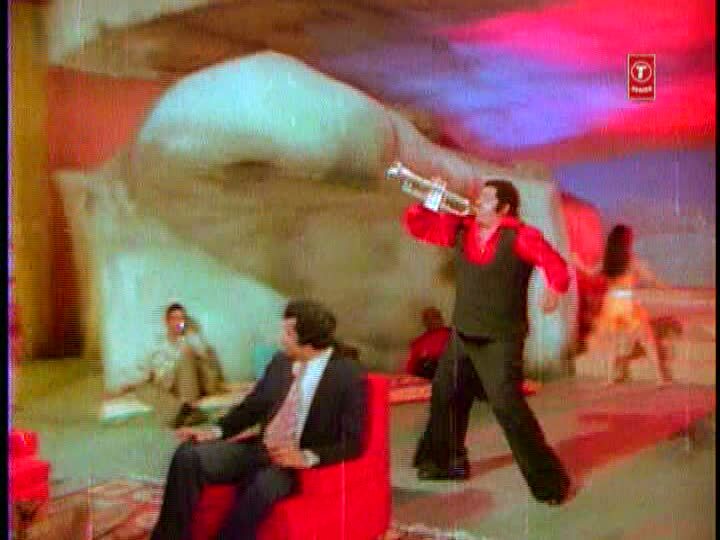 And its a got a funkadelic score n music by funkmasters Kalyanji n Anandji! So check those out, they should be a lot better than this one in terms of Randhir content! THIS. I. MUST. SEE. It's the Amjad Khan screencaps that drew me in. 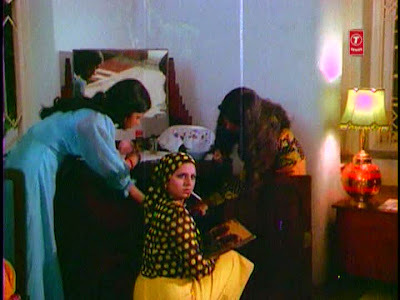 Though I love the conjecture about the Kapoor household too. Beth you've done it again! Amaluu - Hee! It's pretty bonkers. 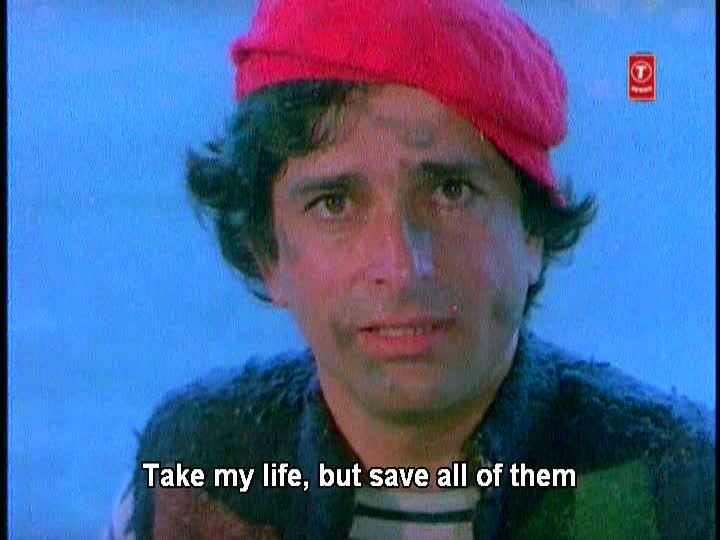 I'm not sure I would have made it through without Shashi and Neetu, but who knows! It has a lot of really fun elements, and Amjad is truly great. I have another of his villain-in-a-lair films to write up for today as well! Woohoo! Hey Rum, I thought RD Burman gave the score for Jawani Diwani. I will check my DVD (that has just arrived) and confirm this!